With the advent of Insolvency and Bankruptcy Code, 2016 the corporate debtor has been curbed down from every corner and not only the financial creditors i.e. those who have provided financial assistance to the corporate debtor but also the operational creditors i.e. those who have provided services in one or the other way to the Corporate Debtor which includes suppliers, employees etc. can drag the corporate debtor to National Company Law Tribunal to recover their debt. As stated in section 5(21) “operational debt” means a claim in respect of the provisions of goods or services including employment or a debt in respect of the repayment of the dues arising under any law for the time being in force and payable to the Central Government, any State Government or any local authority. The intention of the code is to confine operational debt only to four categories i.e. The above mentioned list is inclusive but not exhaustive. What constitutes operational creditor under new code? 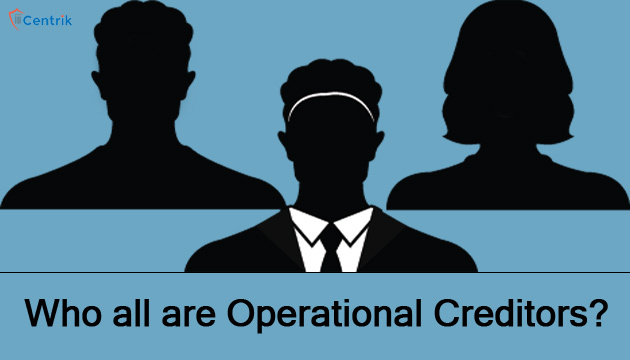 According to section 5 (20) “operational creditor” means a person to whom an operational debt is owed and includes any person to whom such debt has been legally assigned or transferred. In other words, operational creditors are those creditors where liabilities arise from transactions on operations. Thus, the wholesale vendor of spare parts whose spark plugs are kept in inventory by car mechanics and who get paid only after the spark plugs are sold is an operational creditor. Similarly, the lessor that the entity rents out space from is an operational creditor to whom the entity owes monthly rent on a three-year lease”. Pre-requisites for an Operational Creditor to initiate Insolvency? Before initiating insolvency resolution process, operational creditor has to serve the corporate debtor under section 8 (1) with a demand notice of 10 days with attached invoice to the corporate debtor asking him to pay back the dues owed by the corporate debtor within those 10 days which otherwise will result into the initiation of Corporate Insolvency Resolution Process against the corporate debtor. In the case of Era Infra Engineering Ltd v Prideco Commercial Projects Pvt Ltd, the operational creditor has failed to issue the demand notice under section 8 to the corporate debtor stating that notice issued by him earlier under section 271 of the old regime for winding up would constitute demand notice only, hence he is eligible to file the petition under section 8 of the IBC. After considering the various contentions/submissions of the operational creditor, the National Company Law Appellate Tribunal (NCLAT) held that as per provisions of section 8 read with Rule 5 of the Insolvency and Bankruptcy (Application to Adjudicating Authority) Rules, 2016 (Adjudication Rules), operational creditor can file the petition for initiation of corporate insolvency resolution process only after the expiry of 10 days from date of issuance of demand notice in the prescribed format under IBC. Hence, adjudicating authority held that section 8 read with rule 5 of the adjudication rules are mandatory. From the above elaborations we can conclude that anyone who has provided any services to the Corporate Debtor or some goods etc. against which the Corporate Debtor had an obligation to make the payment will fall under the definition of the corporate debtor and can file the application for initiation of the Corporate Insolvency Resolution Process against the Corporate Debtor.